This is a bit of a summer classic and as such this version takes its cues from many versions made across the Mediterannean - Italian Parmesan, Turkish-style rice, French anchovies... you get the idea. While they take a little time to prepare, they keep well, are delicious hot or cold and can easily be made in advance - perfect for entertaining or picnics! Preheat the oven to 180°C, then while it comes to temperature, prepare the filling for the peppers. Thinly slice the leek and then chop one of the peppers and the courgette into approx 1cm pieces. Stir in the cumin and mint and sauté over a medium heat until soft, then thinly slice the mushrooms and add to the pan alongside the roughly chopped anchovy fillets. Cook until the mushrooms are done then set aside until ready for the next step. Meanwhile, put a pan of lightly salted water on to boil, lightly toast the orzo in a dry pan and cook the rice and orzo together until done - about 11 minutes. Drain the rice and add to the pan with the vegetables. Mix together, then re-cover while you prepare the remaining peppers. Slice the peppers in half lengthways and take care to remove all the seeds and pith. Place each half pepper face-up on a baking tray and brush the insides with a little olive oil. Season with salt and pepper then spoon in the rice and vegetable mix, pressing it in so it is tightly packed. Finally, mix together the parmesan and breadcrumbs and stir in a little more mint if you like, then sprinkle on top of the peppers to give a delicious, crispy crust. Cover with foil and bake in the oven for 45 minutes. You will have some of the rice and vegetables left over after stuffing, so once the peppers are cooked, give it a quick blast of heat and serve alongside the peppers. 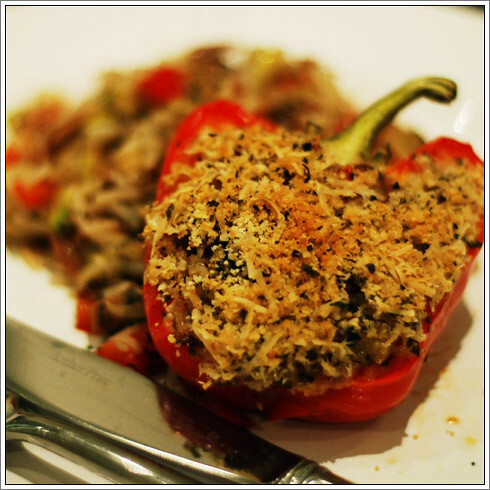 I'm not a fan of peppers, but I do love stuffed tomatoes and I adore the idea of mixing orzo and rice as a stuffing. In fact I love the idea of this stuffing so much, I'm doing it tonight for dinner. Can't wait! i must admit, i raised an eyebrow when i saw your comment arrive in my inbox as my first thought was "but she hates peppers! ", but yes, this works well with just about any vegetable that can be stuffed. i suspect that with the parmesan crust it would also work well as a filling for marrow. orzo and rice together is a wonderful thing! whenever i go to turkey i develop an obsession with the rice pilaf, which usually extends well beyond the end of the holiday.